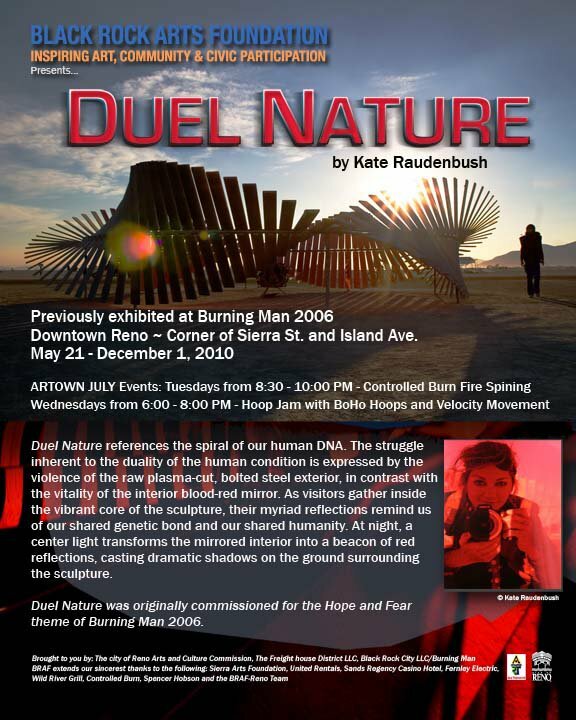 Previously exhibited at Burning Man in 2006, Duel Nature, by artist Kate Raudenbush, is unique in its materials. During Artown – Fire dancers and spinners from Controlled Burn will entertain Tuesday evenings 8:00 – 10:00. Hula Hoopers from Velocity Movement and bohohoops present “GET HOOPED” at Hoop Jams on Wednesday evenings from 6:30-8:30 – all levels and ages are welcome. Hula hoops provided or bring your own! “Duel Nature references the spiral of our human DNA. The struggle inherent to the duality of the human condition is expressed by the violence of the raw plasma-cut, bolted steel exterior, in contrast with the vitality of the interior blood-red mirror. As visitors gather inside the vibrant core of the sculpture, their myriad reflections remind us of our shared genetic bond and our shared humanity.” says the artist Kate Raudenbush.